From all that we have seen until this point we also will take a look at the meaning behind the whole ceremony of the cutting of the vasilopita. We will briefly present some of these meanings, which come out of this beautiful ceremony. The first is that the New Years Greek vasilopita which is cut at the table either on the night of New Years Eve or the afternoon of New Years Day is an element of family unity. This is a family holiday, which later was transferred to associations and other social events. It is significant that the head of the household is the one who cuts it into pieces and distributes it to his fellow diners. Also, pieces are cut for Christ, the Panagia, Saint Basil, the house, the poor and those who are in distant places. These are all mentally present at the ceremony which thus acquires the unity between the rich and the poor, the living and the dead, those who are present and those who are far away, saints and sinners. Thus it is a custom that is "peaceful, centralized and unitary" and reminds us of the early Christian love feasts. Those in attendance eat one piece, remembering the saints and their emigrant brethren and the whole ceremony resembles like a "collective love ritual and strengthening" (Demetrios Lokatos). 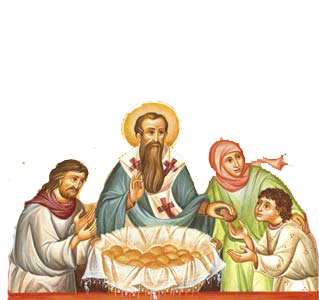 In a similar case, during the Divine Liturgy, as it is preserved in the Didache of the Holy Apostles, the Priest would raise the bread with his hands, and would say a prayer which had the meaning that just as the bread consisted of grains that were gathered from various mountains and thus constituted a unity, which was that particular bread, so also may the power of God gather the entire Church from the far reaches of the inhabited world into the Kingdom of God. In other words, all Christians who live in various lands and nations consist of the Orthodox Church, which goes beyond nations and homelands and moves towards the Kingdom of Heaven. The second meaning is the quest for longevity. The cutting of the vasilopita is associated with wishes for other people to live healthy throughout the year, as well as to live for many years in their life. The expectation of longevity is a substitute for the remembrance of immortality and an indication of the search for eternity. People feel that their whole existence is not limited by existential limitations, but it extends beyond biological life. The third meaning is the pursuit of happiness. The word "happiness" (in Greek ευτυχία/eutychia) consists of two words, the word eu and the word tychi, which means "good luck," that all things may turn out well in your life. Yet it is impossible for someone's life to be at the mercy of fate and destiny, neither is it possible for it to be controlled by a determinism that eliminates a person's freedom. In the Orthodox Church we do not talk about luck, but of God's Providence that directs the world, just as we also talk about synergy, which means that God acts and people freely act or synergize with Him. I think, however, that the human problem is not happiness, but freedom. It is said that someone can feel happiness, and even a temporary pleasure can satisfy an instinct or desire. This, however, does not give complete and timeless joy. Therefore, the problem is that people should rejoice in life, to rejoice in the good things of life, but also how they will have continuous existential freedom, either in the plenitude or the lack of material goods. The fourth is the eating of bread which is an element of life. The sacred Psalmist writes "bread makes firm the heart of man." Bread together with wine are the basic elements of human life, and it is significant that the offered vasilopita in ancient Greece was called a cake. Our distinguished Professor Nicholas Papanikolaos, last year while listening to the prayer of the ceremony in which it speaks of God blessing the cake (πλακούντα/plakounta), reminded me that this particular word is found also among the ancient Greeks. He also stressed that our cake not only recalls the word but also the shape of the placenta from which the embryo is nourished in the womb of its mother. So the cake of the vasilopita can teach us that through it we can be nourished by the heavenly Bread. As the fetus through the placenta receives oxygen and nutrients from the blood of the mother, so we, who according to ecclesiastical writers live in a womb, the womb of this present life, we are preparing to be born in another life, and in the placenta of the heavenly Bread we can receive existential oxygen with spiritual nutrients to overcome death which is associated with biological life. Of course, many times the vasilopita is offered in the shape of a square, and not circular. Beyond the practical purpose of this shape, we can also see another significance, that the circular is associated with human emotions, the heart, while the square shape is associated with reason. Hence a mature person is considered to be squarely rational and to be emotionally mature. The Church always transforms the elements of life and the customs it encounters. Thus at the feast of the Sun god in ancient Greece, Christmas was celebrated, and Christ came to be called the Sun of righteousness. And many other such customs has the Church transformed. Within this perspective we have to see the transformation of the custom of vasilopita. For this reason the Church produced a special service for the cutting of the vasilopita, so that this custom which has so much meaning can become churchified. At the beginning of the service we chant the dismissal hymn for the Despotic Feast of the Circumcision of Christ, the dismissal hymn for Basil the Great, and the kontakion for the New Year. Then the Bishop or Priest addresses prayers to God to bless the new annual cycle of the goodness of the Lord, that it may be peaceful and salvific and, of course, to bless those present at the sacred service. Lastly, he reads the relevant prayer in which he supplicates Christ, who has power over times and years and directs our lives, to bless our entry into the new annual cycle of the goodness of the Lord and bless the cakes (it is characteristic to be called cakes like in ancient Greece) which Christians have offered to the honor and glory of Basil the Great. He then supplicates God to send His grace upon those who prepared the gifts and those who are about to taste them. Then a confession is given by those in attendance at the service that we hope in God, who is the living God. And we furthermore supplicate God to bless the beginning and ending of this year, to multiply in our lives good things, and that He will direct our steps in the keeping of His divine commandments, because, as it is said, man does not live by bread alone, but he also needs spiritual nourishment. The entire service converts and transforms the social event into an ecclesiastical and spiritual event. I felt the need to analyze this ceremony and service, because all things in our lives must become meaningful. We must go beyond the surface and enter in into the depth of events and things, and especially give an existential interpretation in all aspects of our lives. For all things in our lives are essentially meaningless, namely those things that do not have meaning, but we give them meaning whether it be positive or negative.